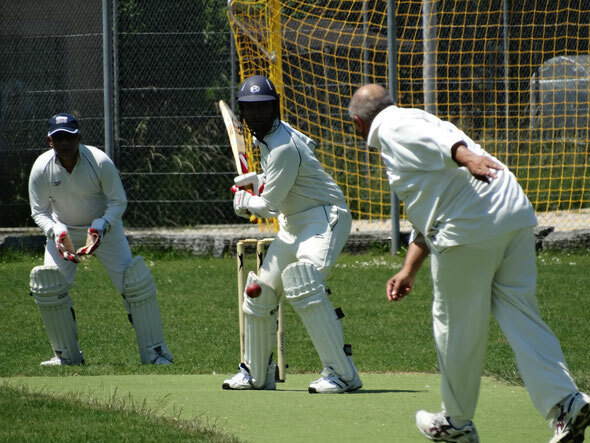 The tournament opened with a Group A match between the two Winterthur teams, WCC 1st coming out easy winners reaching the WCC 2nd total without losing a wicket. WCC 2nd Team faired much better against Freiburg-Nomads, losing out by just 24 runs, but it was Freiburg-Nomads that secured a spot in tomorrow's final after beating WCC 1st Team by 9 runs in the last game of the day. In Group B Zurich Crickets beat Strasbourg Strollers by 40 runs, but lost by the slimmest of margins in their second game against Freiburg Cricket Club. That meant Freiburg-Nomads had to wait until the first game on Sunday to find out who they would face in the final. If Freiburg CC beat Strasbourg Strollers i it would be an all-Brisgau final, but if Strasbourg win, it would all come down to average runs-per-wicket to decide the standings in the group! As it turns out Freiburg CC won easily. Strasbourg did however, beat Winterthur 2nd in the first of the games to decide the eventful standings, while Winterthur 1st beat Zurich Crickets to finish 2nd in the competition oeveral. And it Freiburg CC that cam out on top against their neighbours, limiting Freiburg-Nomads to just 84 runs which they reached with ease, without losing a wicket and with 2.1 overs to spare. Congratulations to Freiburg CC for winning the festival and thanks to all the clubs, supporters and helpers in making the tournament possible. A strict interpretation of the wide ball law will be imposed. Any passing the batsman on the leg-side is wide. Two runs will be awarded for Wide & No-Ball extras. The ball will not be re-bowled unless it is the final over of the match. The side scoring most runs wins and will collect 4 points. No points will be awarded to the losing team. The points are to be shared in the case of a tied match (2 points each). A match will be tied if the scores are level, irrespective of the number of wickets lost. In the case of final points’ parity, the total runs scored overall by a competing team will be divided by the total number of wickets lost overall. The team with the higher run ratio will be listed in a better position. There will be a 5 minute interval between innings and between matches. The remaining playing time of the match will be equally divided. Each innings may be ended by the umpires after 50 minutes of play (a required over rate of approximately 17 overs per hour). If the twelve overs (item 2) have not been acheived within the allotted time in the first innings, the second innings will be limited to the same number of completed overs bowled in the first. Cricket balls and lunches will be provided by the organisers. No spiked shoes are permitted. Each team will be expected to provide a scorer and an umpire. This is a friendly festival and all clubs are encouraged to participate in any social activities. 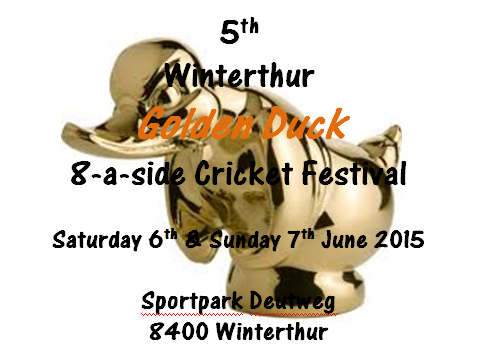 Note: These regulations are also available on the WCC website at www.winterthurcc.ch.